Images of a rare African black leopard - known as panthers - have been captured in Kenya, the first verifiable record of the animal for nearly 100 years. This is the first confirmed sighting of a rare African black panther in nearly a century. Researchers from the San Diego Zoo were studying ordinary leopards in Kenya's Laikipia County, when the elusive cat made its debut. Black leopards - which are also called black panthers - carry a gene mutation that makes their coats black. But the infrared cameras used by the team, helps show off their spots. British wildlife photographer Will Burrard-Lucas also captured the creature nearby. Collectively these are the first confirmed images from Africa in nearly 100 years. 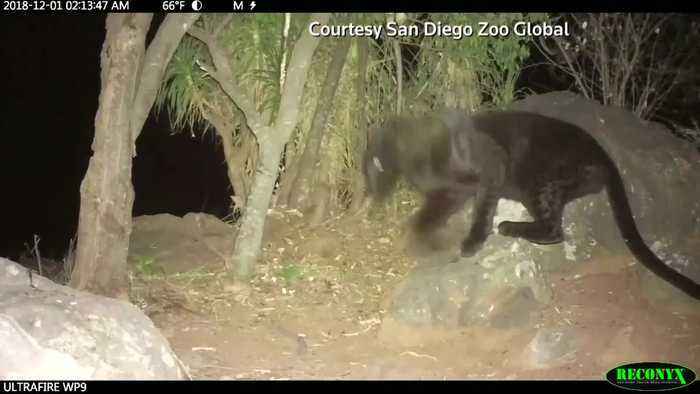 Nicholas Pilford from the San Diego team explains why they're such a special find: (SOUNDBITE) (English) SAN DIEGO ZOO GLOBAL SCIENTIST NICHOLAS PILFOLD SAYING: "We don't see black leopards anywhere further south of Kenya. We've only seen them here in Kenya, and we've had reports in Ethiopia. So this suggests that there's a lot of conservation value here in protecting what may be a very special sub species of leopard." San Diego Zoo says scientists had assumed their black coat could be explained by evolution - a way to camouflage them from predators. But this new discovery in an open, arid habitat could change what scientists know about the panther, and offer clues about the secretive animal.